Piso Fare and Promo Fares were recently offered by Cebu Pacific Air and Air Asia. 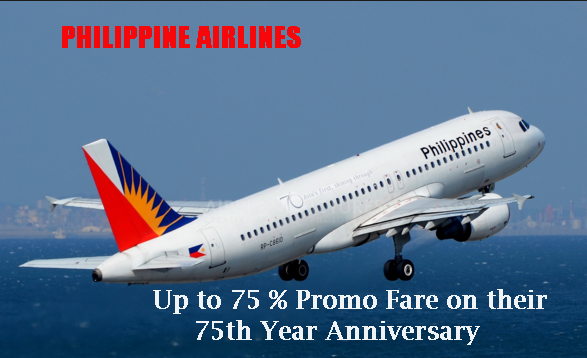 Now, it is Philippine Airlines turn to propose their on-coming promo fare in celebration of their 75th Year Anniversary. Yes, Piso Fare friends, all of us still has something to look forward this week, the Philippine Airlines Seat Sale. As shown on the airline’s pre-launching promo campaigns, passengers may get up to 75% off discounted fare upon booking. Are you happy with this news? The Philippine Air Lines Promo Fare selling period is from March 15 until March 19, 2016. The discounted tickets are good for travel from June 1 to December 10, 2016, so there will be promo tickets for the months of June, July, August, September, October, November and the first 10 days of December 2016. But there’s more! PAL seat sale is also available for January 16 to February 10, 2017 trips. Are you not excited? PAL or Philippine Airlines is the first Philippine airline company and said to be Asia’s oldest airline operating under the same name. At present, Philippine Air Lines and sister company PAL Express are flying to amazing domestic and international destinations. This post aims to inform our readers to get ready with low cost Philippine Airlines flights coming on the next 2 days. Prepare for the rush purchase of your cheap flight tickets. Tickets are LIMITED, so BOOK Fast and get the best promo deals from Philippine Airlines! LIKE us on Facebook at PISO FARE TICKETS for travel tips, airline Promo Fare, PISO FARE 2016 and PISO FARE 2017!